How To Make Poop Emoji Milkshakes! Hey, party peeps! 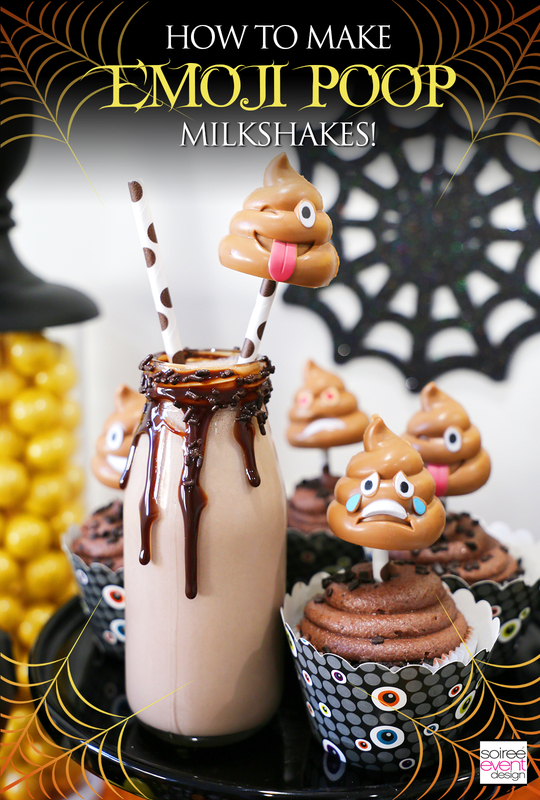 Halloween is coming up and if you’re looking for a fun and kid-friendly Halloween party, then you should check out my Halloween Emoji Party where I served these POOP EMOJI MILKSHAKES! with yummy Poop Emoji Cupcakes. 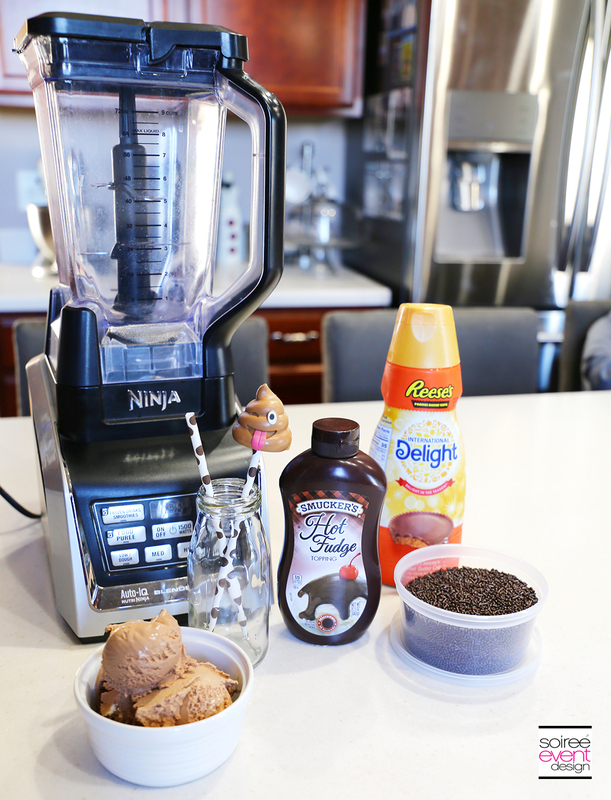 Add 6-8 scoops of chocolate ice cream, 1/2 cup Reese’s peanut butter coffee creamer and 1/2 cup milk to a blender and blend until smooth. 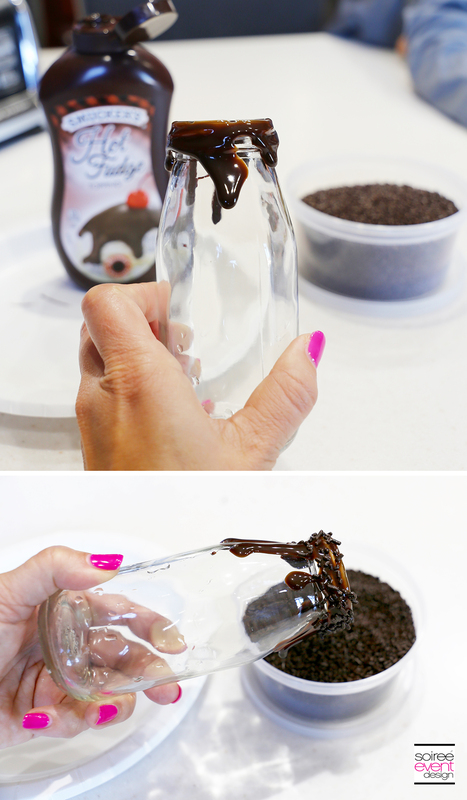 Pour hot fudge around the outer rim of the glass milk jar then sprinkle chocolate jimmies sprinkles on the fudge. GIRLFRIEND TIP: You can prepare your glasses ahead of time and put them in the freezer until your party so you don’t have to rim all the glasses while kids are waiting AND the chocolate fudge dripping will harden to the glass so it won’t run all over your fingers while drinking them. 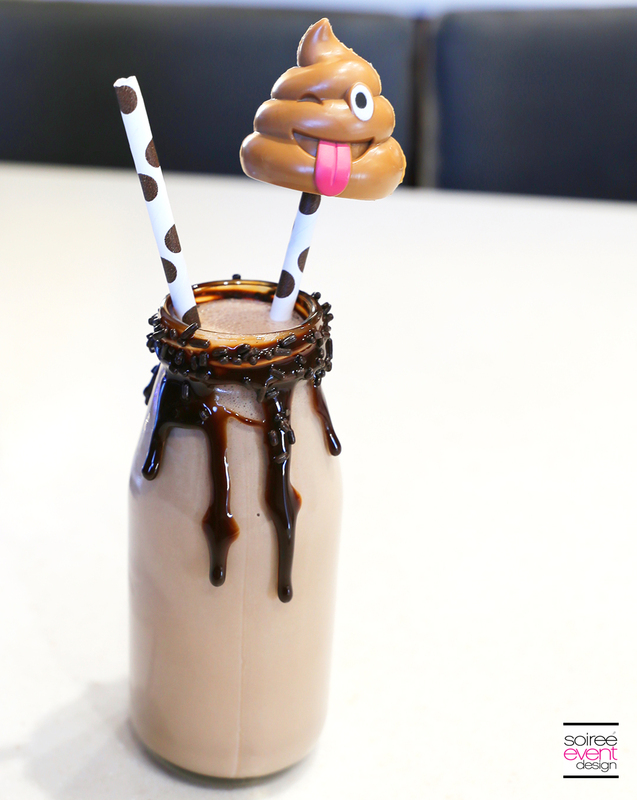 Pour the milkshake into the frozen glasses until full and serve with a Poop Emoji Drink Stirrer (for decoration only) and a brown and white polka dot paper straw to drink out of. 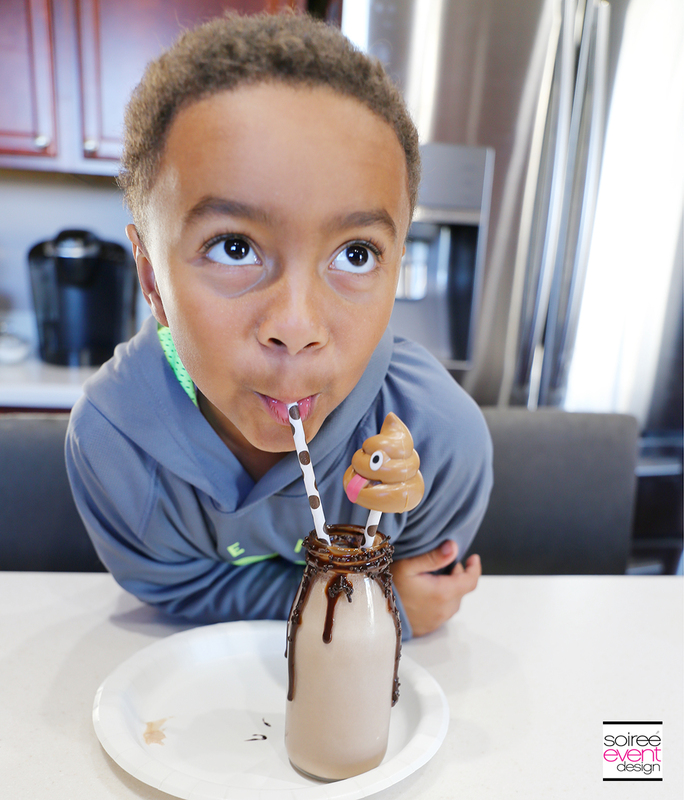 See how to make the Poop Emoji Drink Stirrer here. That’s it! These were so fun to serve at my Emoji Halloween Party. Be sure to check out the party as well as my Poop Emoji Cupcakes. Is it bad when I saw the title I giggled? The kids would LOVE these!! I live in a house full of boys who are all about the poop. They are going to love these milkshakes! 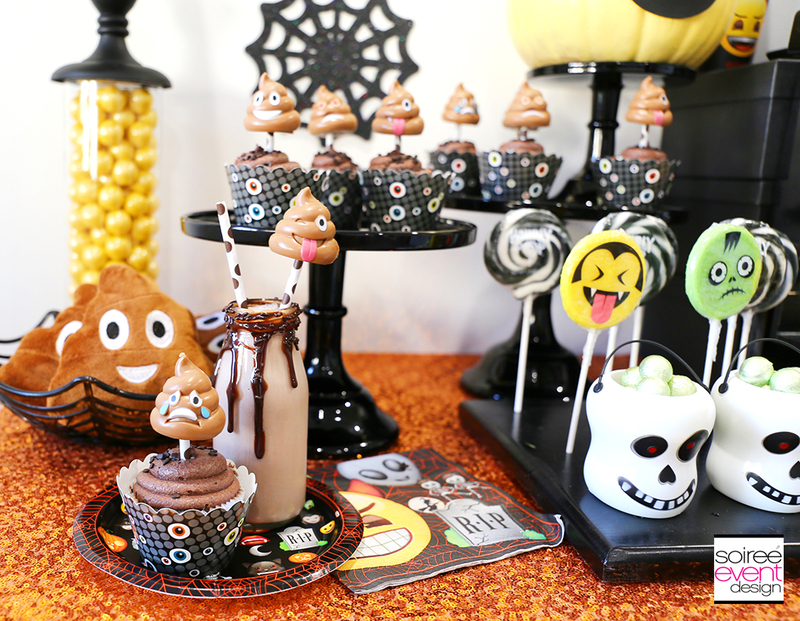 These are so cute!I wish my kids were younger and wanted a poop party, lol. I am going to try to make these anyways because I love shakes and think these will taste really good with the coffee creamer. HAHHAA! How clever are these? The poop emoji seems to be really popular with kids right now. I bet my niece would flip for one of these milkshakes! Such cute drinks. I really love how you put chocolate on the rims. Great use again of the poop. Those milkshakes look great, I love Reeses and never tried the creamer so this would be a perfect way to start. My kiddo is so into the poop emoji that he would absolutely go wild over this. I might surprise him with this on Halloween night. Just something fun to make before he goes trick-or-treating. I love that Reeses creamer!! This is a fun way to make the kids laugh and have some fun! Really cute recipe. My girls are going to love this. 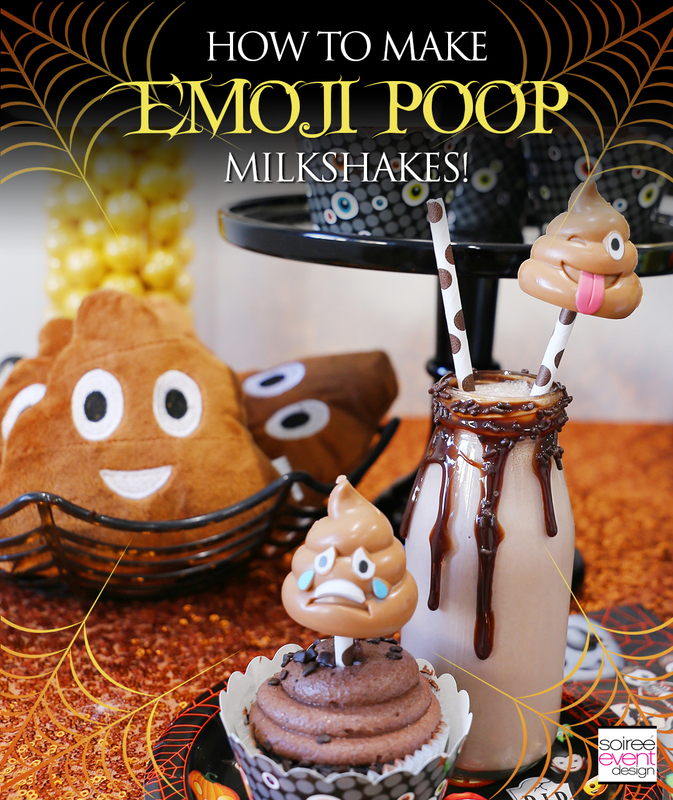 There is so many emoji poop items and I think they have them all. These are so funny! I can not believe how popular the poop emoji theme really is. LOL my kids are obsessed with poop emojis. These are too fun! These are so cute!! I bet they are the tastiest poop-related things ever! My kids are obsessed with the emojis! They would love these! They look awesome! This is such a fun idea! I can imagine that the kids would totally love this and find it hilarious. This is ADORABLE. I love the idea of doing something this cute. I am willing to bet my kids would totally get a kick out of this. Oh my gosh, these are the funniest milkshakes! Using the hot fudge and sprinkles to decorate the glass was a really clever idea! I don’t know why this freaks me out so much… I want to think it’s funny! I know my kids would LOL! Haha, love this idea! My son and his friends would be thrilled if I made these for them. When chocolate is involved, you know it’s going to be one good recipe! That’s exactly what this is! I love the milkshake topper too. Ahahaha.. Why night , right? When the kids will have fun, why not do it and do it with them. They are cool and cute. Nice one! Oh this is too cute! And I didn’t even know Recee’s Peanut Butter coffee creamer was a thing! My son (and probably my husband, too) would get such a kick out of making these! Hahah these are absolutely amazing what an awesome idea for a milkshake, I think they are needed at all Halloween parties. The poop emoji has been everywhere, even before the Emoji movie came out. These are great! And who doesn’t love a tasty peanut butter and chocolate milkshake! The kids are absolutely going to love these. Who would have ever thought grownups would be creating crafts and food around poop? But we do, and everyone loves it! So funny! omg these are too hilarious! also very creative. I’m going to suggest doing this for my nephews birthday party this year! he loves the poop emoji! These are adorable and my kids would love these. I have pinned it to try. Oh my gosh this cracks me up. 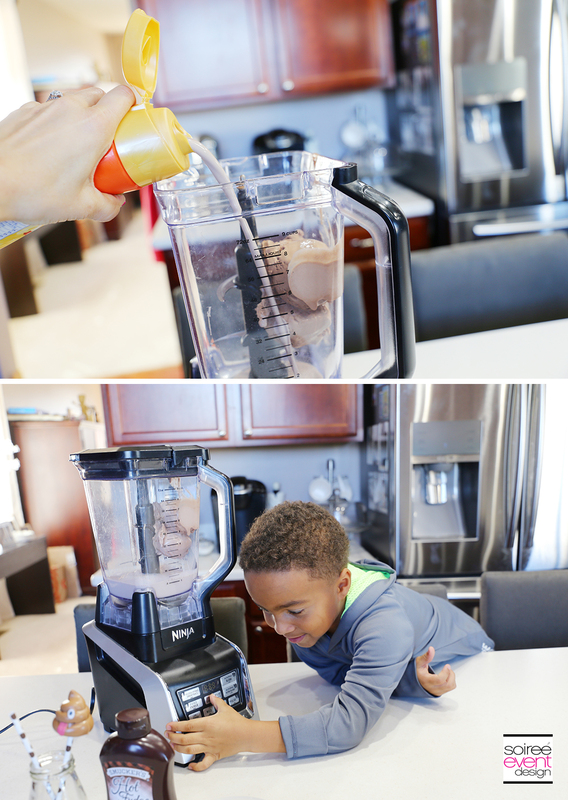 Kids are so funny that now a poop shake will make you the coolest mom around. Kids love the poop emoji! This looks delish and adorable!! Now these are some Halloween treats I can get on board with! They look so yummy and my kids would have a blast making these with me. Thanks for sharing! You had me at Reese’s coffee creamer. These milkshakes look so indulgent and delicious. I need to give this a try this weekend. Chocolate and peanut butter are my two favorite flavors. I love the addition of the poop emojis. It’s such a fun touch with these delicious milkshakes. Oh gosh I just love the title of these milkshakes. My grandkids would love them. As you know the word poop is so much fun for kids, and adults alike. These look yummy! WOW! My son would LOVE to make these. You are simply amazing! My daughter would think I was the best mom ever if I made these. She loves any and all milk shakes and the poop would just add to the fun! Haha – how fun! My 7 year old would absolutely love these! I think I’ll pick up supplies to make these this weekend! This is really a cute idea for a milkshake. I’m sure kids will get a big kick out of it because of the poop emoji. Haha! Cute, fun and creative! My kids would get a kick out of making these for a Halloween treat next week! This is so adorable! My son would absolutely love these, I’ll have to attempt this. Thanks for sharing! This would be fun for halloween party. I know it’s going to be a hit among the children. I love milkshake so I’m going to make this. These milkshakes look like they are so.good and fun. Perfect addition to any party! I am so making these! My son is actually going as a poop emoji for Halloween so I know these will be a hit with him! LOL…this is so funny and super creative. I don’t know any kids who would not enjoy this. My daughters would love these! That emoji is so popular right now!! Lol I don’t like Halloween but this poop emoji looks skilled. Lol. Good job & he looks like he likes it. OMG hahahahaha I love these poop milkshakes so much! I totally saved this on Pinterest so I can surprise my kids! Wow poop milkshakes. How do kids do it I mean how do you even manage to make it semi cute. Amazing! I love it! This is so cute and spooky, I will surely make it. Ok I love this. My kiddos would get a kick out of this for sure! We will have to make these. Oh my…I believe this is not only good for kids, coz am a fan of milkshake and I love to have one here right now. Lmbo these are to funny. I can just see my son saying poo poo.